Before I went on holiday, somebody posted on Facebook an excerpt from Peter Costello's book "In Search of Lake Monsters". I reproduce that piece below. 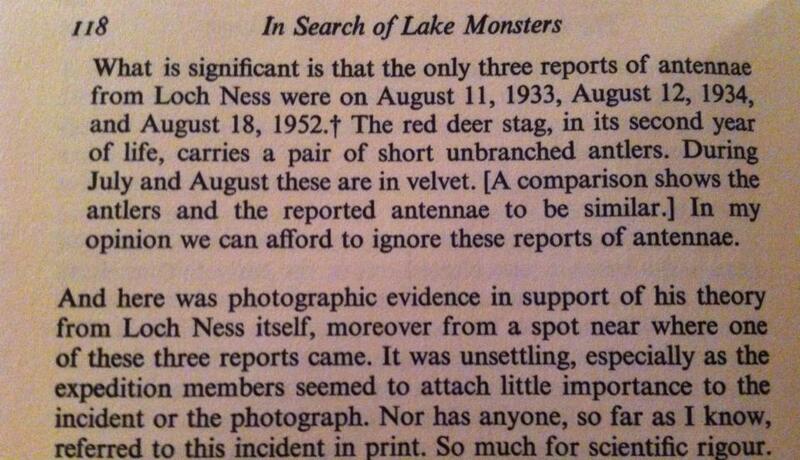 Now it is not a new thing that deer have been suggested as misidentified Nessies, but that is not the problem. Every "believer" accepts people misidentify objects for the Loch Ness Monster, but not to the ridiculous proportions demanded by sceptics. The problem lies in this particular treatment of three reports. Peter Costello stated that reports of monsters with horns could actually be deer because younger stag had short unbranched antlers in August and that was when these three horned monster sightings were reported. Maurice Burton, in his book, The Elusive Monster, echoes this theory by printing a photograph of the proposed type of deer. With this in mind, I decided to update the list of horned reports forty years on. The list is shown below, beginning with the original three. There are some horned sightings which I have excluded. The first is the legendary MacRae film which cites horns, but we have no proof that this eyewitness event even took place (if it did, it may have been in July). The second is the (in)famous 1975 Rines underwater photograph which alleges to show a horned head. Since deer don't tend to travel 40 feet under the surface of Loch Ness, it's not a valid report for this type of discussion. Finally, Maurice Burton mentions account number five. It was a sighting involving multiple schoolboys but not all describe horns. I include it nonetheless, because if one starts stripping out sightings based on various objections, one assessor may keep all them and another may reject the lot. Looking at the cases in general, the most famous horned case is number three - Greta Finlay. You can read more about that report in my previous articles here and here. Case number one may also be familiar to readers as it is a curious affair involving what seems to be no more than a head. Maurice Burton tried to present this as another deer event as the following scan from his book demonstrates. However, this time a hornless deer is invoked rather than a horned one (which rather begs the question as to why Peter Costello used it in his August Antler theory). Maurice Burton also discusses the second case in his book involving a Mr. Peter Grant. I went to the closest source for this particular case, which was printed in the Northern Chronicle of 15th August 1934 and is reproduced below. No sketch accompanied this account, so Maurice Burton sent the report to some artists he knew and asked them to draw what they thought was being described. These drawings are again reproduced below, though one must be aware that there will always be a degree of subjectivity when one is attempting to draw an animal which one has not personally seen or is not under the supervision of the one who did. The variation in the drawings exemplifies this. So what are the problems with Peter Costello's analysis? The first is the chart below which shows the monthly distribution of monster reports. The peak month is August which coincides with the peak month for horned monster reports. The explanation behind this chart is simple, more people are watching the loch in the Summer months right up to a peak in August which then tails off into Autumn as the tourists leave, the locals stay indoors more and daylight hours decrease. So to treat this theory properly, the data has to be weighted to take into account the increased number of observers in the Summer months. So, for example, we note that there almost twice as many reports in August as there are in September. It is also noted that the number of horned reports is again twice as much in August as it is in September. In other words, the proportions are similar which suggests the variation is not down to deer with velvet horns in August, but the number of observers in each month. Having said that, I won't attempt a reweighting as we come to the second problem.The issue here is the size of the dataset and its useful in finding statistically significant results. Eight reports of horns over eighty years is really not a lot and one wonders if anything statistically useful can be done with it. Overall, this eight constitutes only about 0.6% of the entire sightings record. This inadequate dataset is demonstrated by the fact that there are no horn reports for the next busiest months of June and July. That signifies an inadequacy in the dataset and hence making observations about August reports is not a valid approach. Thirdly and finally, I question whether deer horns in August is in fact a viable theory at all. When you read Peter Costello's statement again, you may be led to think that August was the only month in which deer display monster-significant antlers. So, we are told that these short antlers are covered in velvet in August and this somehow makes the deer more monster-like. But what about June, July, September and October? Of course, the antlers will be growing throughout gaining and then losing this velvet covering, but I fail to see how deer in these other four months are significantly less deceptive. The table of antler growth below charts the development of deer antler. I note that the deer sheds its first set of antlers in April/May of its second year of life and the new set grows to full size by August. This suggests that antlers that are so-called "monster-significant" should be present in July and perhaps even June. The absence of horn reports in these months suggests it has nothing to do with deer antler but other non-deer factors. I don't doubt some people have been fooled by deer, but my own conviction is that these are more likely for sightings seen at further distances or hampered by other factors such as brevity of time or poor observational conditions. In the case of reports such as Greta Finlay where the creature was 20 yards away, we can reject deer explanations as forced and naive. 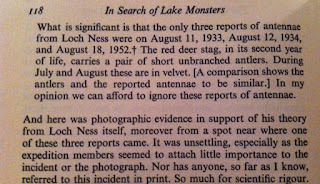 What we can see is that horns are not a significant part of the Loch Ness Mystery. This may be in part due to the fact that most sightings are not amenable to seeing such a small feature. Other close sightings (such as John MacLean) do not mention any such antennae. In fact, the idea of horns on the monster only really became popular with the 1975 underwater "gargoyle" picture which in turn inspired the "Courtship in Loch Ness" painting by Sir Peter Scott. From thereon in, they occasionally appear in the cultural representations of Nessie, such as the recent Water Horse film. But since I accept that sightings such as those by Greta Finlay are genuine, then I accept the concept of "horns" whatever they may be. And there lies the horns of a dilemma, what exactly are we seeing here? One suggestion is that these are snorkels to take in air and are even retractable (which would seem to be their default position). Since I believe the monster is a water breather, I don't see them as snorkels, though retractability is acceptable. More likely to me is the idea that they may be sensory organs akin to barbels which are useful for sensing the dark environment of the loch waters. Of course, one's interpretation depends on how one views the Loch Ness Monster phenomenon; be you fish, plesiosaur, salamander or sceptic oriented. But then again, perhaps the sceptic at the top of the page had no business submitting this argument? It seems that some of that ilk have declared that you can't trust witnesses or the newspapers that report them not to embellish their stories with lies. So, the big question is, how does a sceptic know that horns were not added by the witness or reporter for dramatic effect? They don't, so they have no business giving an opinion on any eyewitness testimony. But, five years on and still going strong, this blog will continue to give its views on what eyewitnesses have seen and will continue to expose sceptical arguments for what they are. Seasoned Loch Ness researchers will know about Constance Whyte. She was the author of the 1957 book, "More than a Legend" and was an influence on later Loch Ness Monster researchers. This we certainly know of Tim Dinsdale who states that her book was a major influence on him before he headed up to Loch Ness for the first time. In fact, she was one of the few people who was a link between the beginning of the Nessie phenomenon in the 1930s and the later activities and research around the loch in the 1960s. I believe she died around 1980. So, it was a pleasant surprise to find this painting on eBay which was created by herself. I did not realise she had other talents. The work depicts the town of Inverness and, though it has no explicit Loch Ness Monster reference, it may be of interest to some readers. The link to the auction is here and the auction ends in nine hours at the time of writing. While I am here on the subject of paintings, I came across this item from the Dundee Courier dated the 20th of September 1934. It refers to a painting for sale depicting the Loch Ness Monster. From the text, it appears to suggest that an artist, based on the River Ness, had seen the monster and executed a painting "on the spot" which rather suggests he was in the process of painting Loch Ness when something broke the surface. I know nothing about any such painting and suggestions are invited as to what this could be. I would be confident that said painting is still in existence, but 81 years on, it would seem an impossible task to track it down.